Sea ice responds to changes in winds and ocean currents, sometimes with origins thousands of kilometres away. Our two articles published earlier this month suggest that a combination of natural variability in the atmosphere and ocean were to blame, though human-induced climate change may also play a role. What happened to Antarctic sea ice in 2016? Antarctic sea ice is frozen seawater, usually less than a few metres thick. It differs from ice shelves, which are formed by glaciers, float in the sea, and are up to a kilometre thick. Sea ice cover in Antarctica is crucial to the global climate and marine ecosystems and satellites have been monitoring it since the late 1970s. In contrast to the Arctic, sea ice around Antarctica had been slowly expanding (see figure below). However, in late 2016 Antarctic sea ice dramatically and rapidly melted reaching a record low. This piqued the interest of climate scientists because such large, unexpected and rapid changes are rare. Sea ice coverage is still well below average now. We wanted to know what caused this unprecedented decline of Antarctic sea ice and what changes in the system have sustained those declines. We also wanted to know if this was a temporary shift or the beginning of a longer-term decline, as predicted by climate models. Finally, we wanted to know whether human-induced climate change contributed to these record lows. Sea ice cover around Antarctica varies a lot from one year or decade to the next. In fact, Antarctic sea ice cover had reached a record high as recently as 2014. Antarctic and Arctic sea ice cover (shown as the net anomaly from the 1981–2010 average) for January 1979 to May 2018. Thin lines are monthly averages and indicate the variability at shorter time-scales. Thick lines are 11-month running averages. That provided a clue. As year-to-year and decade-to-decade sea ice cover varies so much, this can mask longer-term melting of sea ice due to anthropogenic warming. The next clue was in records broken far away from Antarctica. In the spring of 2016 sea surface temperatures and rainfall in the tropical eastern Indian Ocean were at record highs. This was in association with a strongly negative Indian Ocean Dipole (IOD) event, which brought warmer waters to the northwest of Australia. While IOD events influence rainfall in south-eastern Australia, we found (using both statistical analysis and climate model experiments) that it promoted a pattern in the winds over the Southern Ocean that was particularly conducive to decreasing sea ice. These surface winds blowing from the north not only pushed the sea ice back towards the Antarctic continent, they were also warmer, helping to melt the sea ice. These northerly winds almost perfectly matched the main regions where sea ice declined. Atmospheric circulation and sea ice concentration during September to October 2016. The top figure shows the Sep–Oct wind anomaly (vectors, scale in upper right, m/s) in the lower part of the atmosphere; red shading shows warmer, northerly airflow, and blue shading represents southerly flow. The bottom figure shows sea ice extent: green represents more sea ice than average, and purple shows regions of a reduction in sea ice (Figure 2a of Wang, et al 2019. Though previous studies had linked this wind pattern to the sea ice decline, our studies are the first to argue for the dominant role of the tropical eastern Indian Ocean in driving it. But this wasn’t the only factor. Later in 2016 the typical westerly winds that surround Antarctica weakened to record lows. This caused the ocean surface to warm up, promoting less sea ice cover. The weaker winds started at the top of the atmosphere over Antarctica, in the region known as the stratospheric polar vortex. We think this sequential occurrence of tropical and then stratospheric influences contributed to the record declines in 2016. Taken together, the evidence we present supports the idea that the rapid Antarctic sea ice decline in late 2016 was largely due to natural climate variability. Since then, sea ice has remained mostly well below average in association with warmer upper ocean temperatures around Antarctica. We argue these are the product of stronger than normal westerly winds in the previous 15 or so years around Antarctica, driven again from the tropics. These stronger westerlies induced a response in the ocean, with warmer subsurface water moving towards the surface over time. The combination of record tropical sea surface temperatures and weakened westerly winds in 2016 warmed the entire upper 600m of water in most regions of the Southern Ocean around Antarctica. These warmer ocean temperatures have maintained the reduced extent of sea ice. 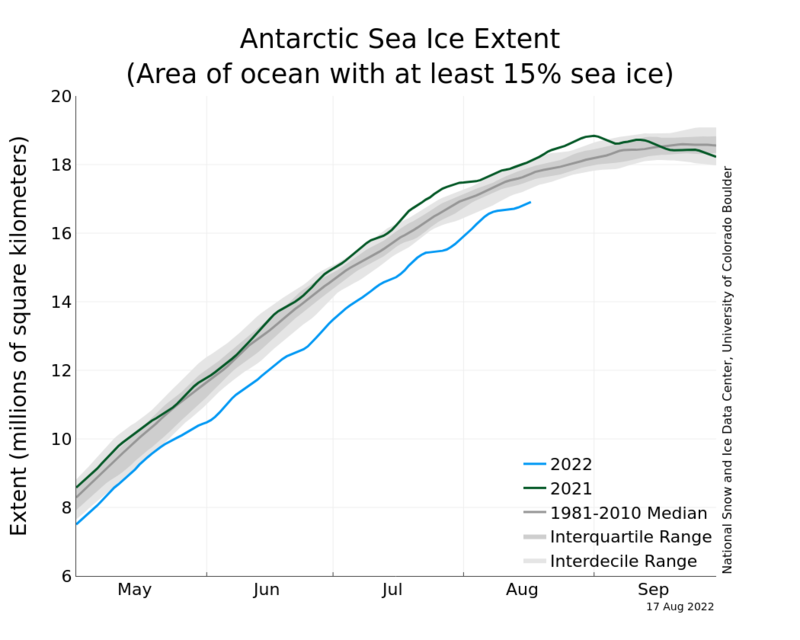 Antarctic sea ice extent is seeing a record low start to the New Year. It suggests the initial rapid decline seen in late 2016 was not an isolated event and, when combined with the decadal-timescale warming of the upper Southern Ocean, could mean reduced sea ice extent for some time. We argue what we are seeing so far can be understood in terms of natural variability superimposed on a long-term human-induced warming signal. This is because the rainfall and ocean temperature records seen in the tropical eastern Indian Ocean that led to the initial sea ice decline in 2016 likely have some climate change contribution. This warming and the recovery of the Antarctic ozone hole may also impact the surface wind patterns over coming decades. Such changes could be driving climate change effects that are starting to emerge in the Antarctic region. However the limited data record and large variability indicate it’s still too early to tell. We would like to acknowledge the role of our co-authors S Abhik, Cecilia M Bitz, Christine TY Chung, Alice DuVivier, Harry H Hendon, Marika M Holland, Eun-Pa Lim, LuAnne Thompson, Peter van Rensch and Dongxia Yang in contributing to the research discussed in this article.